The Behringer MIC2200 Ultragain Pro is a audiophile vacuum tube microphone/line preamplifier that has a 12AX7 tube that really gives a true vintage tube sound. 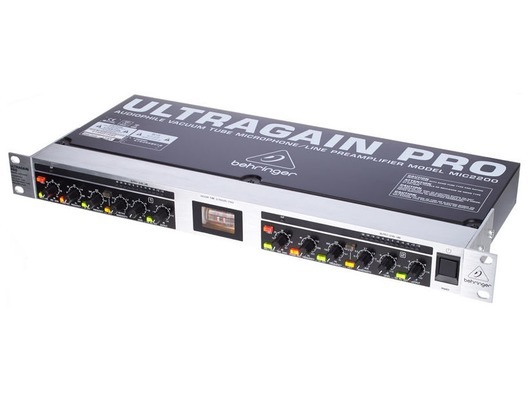 The Behringer MIC2200 Ultragain Pro is suitable for both studio and live applications and gives you ultimate control over your tone. It also has a soft mute +48V phantom power that will enable you to avoid switch on thumps. Tubes can really warm up a signal fast, giving it increased depth and character. Though transistors have succeeded the technology, many musicians agree that tubes deliver a far superior sound. 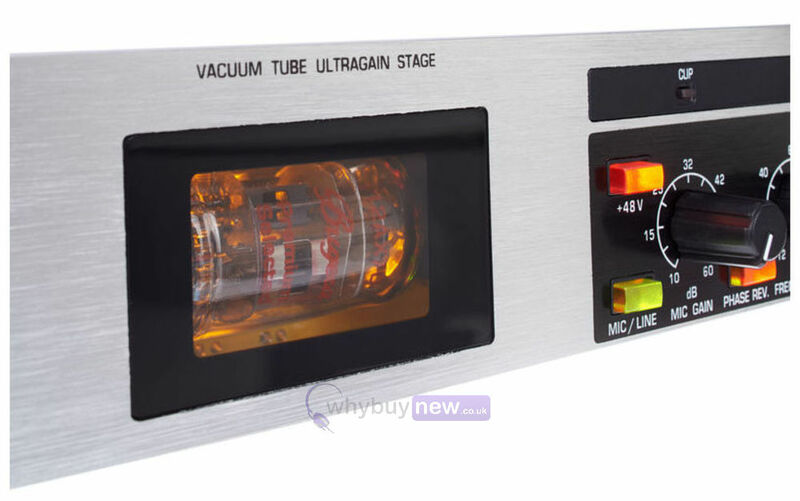 A true audiophile 2-channel Mic/Line preamplifier, the ULTRAGAIN PRO MIC2200's hand-selected 12AX7 vacuum tube gives everything from microphones to acoustic or bass guitars that vintage tube vibe in a dependable and highly-affordable package. The onboard fully parametric EQs provide unparalleled tonal characteristics, allowing you to sculpt instrument and vocal sounds with the ultimate precision and musicality. 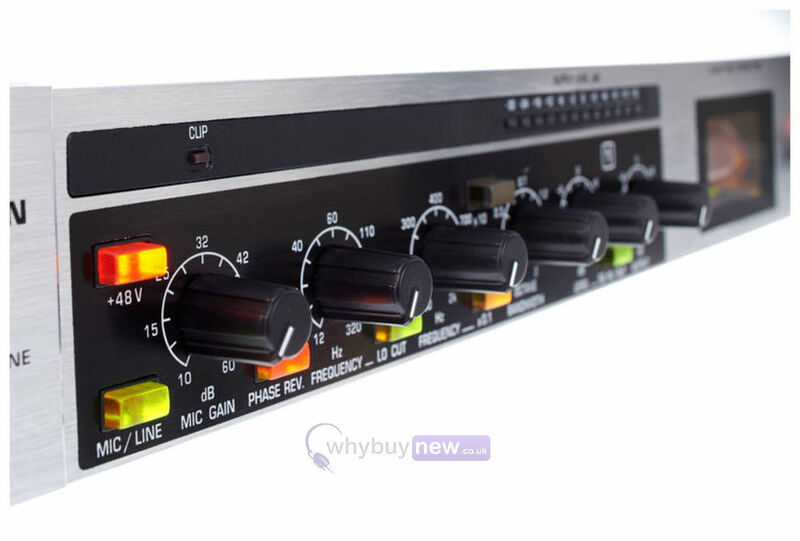 The incredible MIC2200's controls consist of: switches for +48 V phantom power, Phase Reverse, Lo Cut, EQ Frequency range and EQ In/Out; plus Mic Gain, Lo Cut Frequency, Octave Bandwidth, Level and Output knobs. A 12-segment LED meter provides accurate monitoring of output levels. And when used as a high-end DI (Direct Injection) box in the studio or on the stage, the MIC2200 delivers flawless performance and outstanding signal integrity. For further tone conditioning, the MIC2200 features a fully parametric EQ with adjustable center Frequency, Bandwidth and Level per channel. Both channels also feature independent phase reverse switches for maximum versatility. The ULTRAGAIN PRO MIC2200 gives you the sound quality of a 2-channel vintage tube preamp and high-end DI box all-in-one - at a mere fraction of what a true relic of the 1960s would cost. At a price this low, you owe it to yourself to find out where the MIC2200's real tube tone can take your sound.